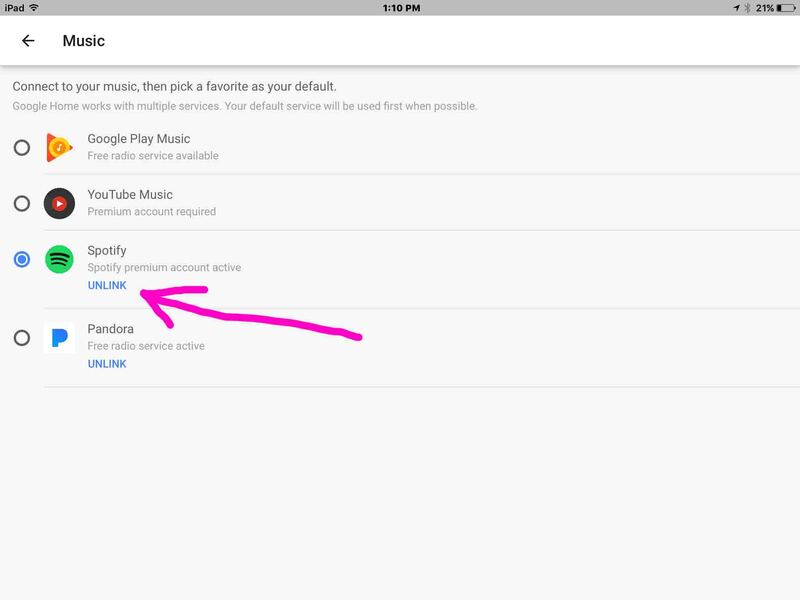 You’ve cancelled your Spotify subscription, and just want to get rid of its remnants from your Google Home app settings, to minimize clutter. You’re giving the device to your parent, and wish to prevent him / her from learning what you listen to on Spotify. Yet you still wish to allow access to other music services set up on your Google account. You like different versions of music than what Spotify offers, and so, you temporarily wish to remove Spotify from your list of searchable music sources. Then, the songs you request will not be found by Google Home on Spotify, but instead, on one or more of your other active music services, which DO offer your desired song versions. These unlink instructions assume that you’ve previously set up and linked a Spotify account to your Google Home assistant. If you have not, then you do not yet require this information. But if so, then read on. On our iOS based iPad, this app is located on page three of the home screen, as illustrated in the next picture by the pink arrow. How to Unlink Spotify from Google Home. Google Home App entry, as shown on the iOS home screen. 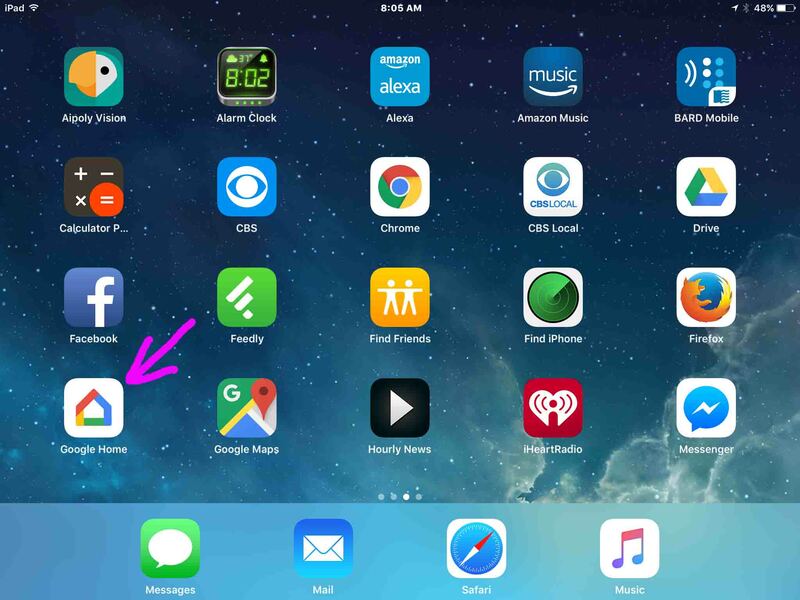 Tap the Google Home app icon on the tablet home screen. After a short pause, the app displays its home screen, as shown next. How to Unlink Spotify from Google Home. Google Home app on iOS, displaying the Home screen, with the Hamburger control highlighted. Located in the top left corner of the home screen, as pointed at by the pink arrow in the previous picture. 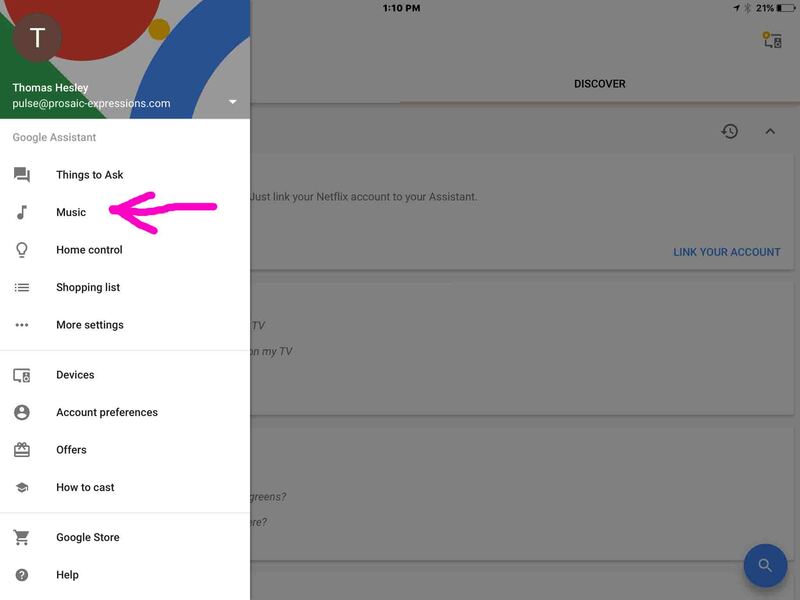 The Google Home app then displays its main menu, as shown next. How to Unlink Spotify from Google Home. Google Home app on iOS, displaying its Main menu, with the Music item highlighted. Find this link, pointed at by the pink arrow in the just previous picture. The Music Service Choices screen then appears, as shown below. How to Unlink Spotify from Google Home. Google Home app on iOS, displaying the Music Service Choices screen, with the (linked) Spotify service highlighted. This is shown in the previous picture. Then, you get the Spotify Unlink Confirmation screen as shown next. How to Unlink Spotify from Google Home. 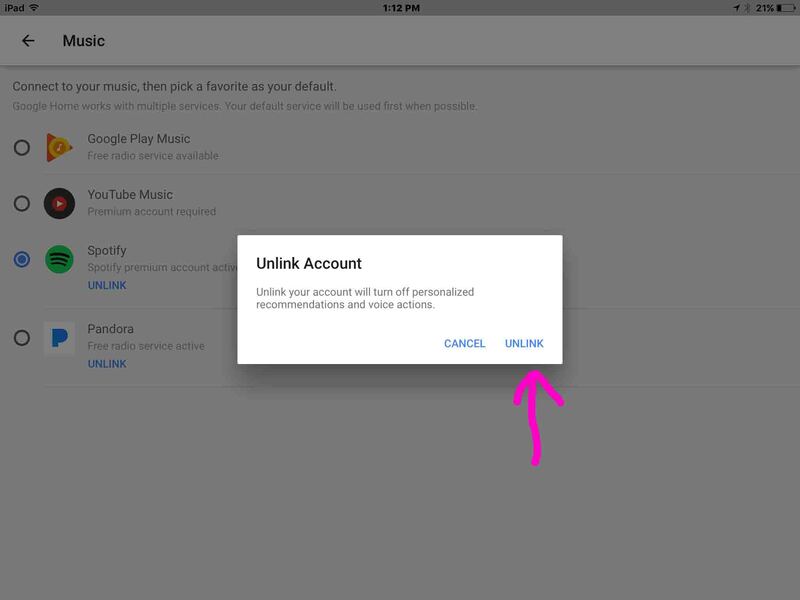 Google Home app on iOS, displaying the -Unlink Spotify Account Confirmation Prompt- window. Find that in the confirmation window shown above, as pointed at by the pink arrow. 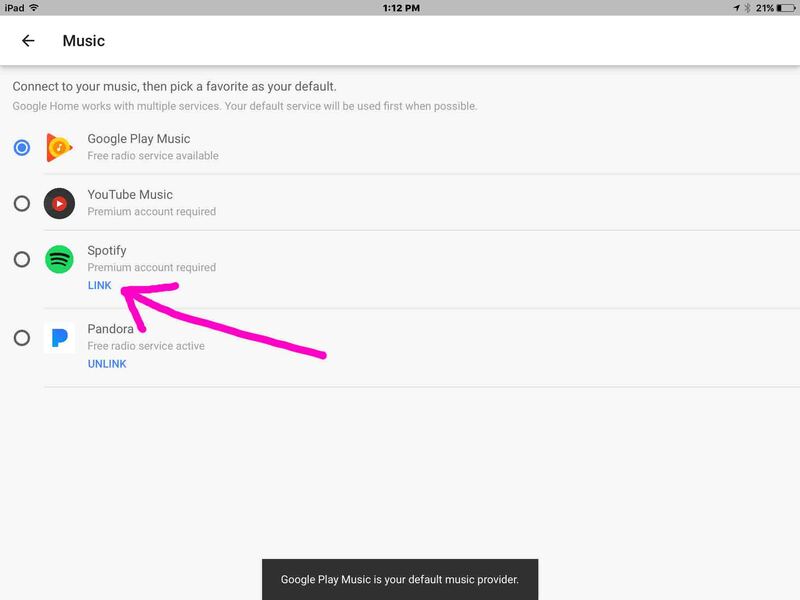 This removes your Spotify account information from the Google Home app and associated speaker devices, and then returns you to the Music Service Choices screen, as displayed in the next step. If however, you encounter an error message, someone else, who shares your Google account, may have already deleted your Spotify profile from it for you. If concerned, check with anyone who has access, just to be certain that the information was not removed due to any sort of security breach. On the Music Service Choices screen, find the Spotify entry and look just beneath it. If you see a blue LINK option, then your Spotify account information has indeed been successfully purged from Google Home. See the next picture for the location of that link, as indicated by the pink arrow. However, if this link still displays as UNLINK, then the information was not properly removed. In that case, jump back up to step 1, and try running through this procedure again, paying close attention to any error messages that might appear along the way. How to unlink Spotify from Google Home. 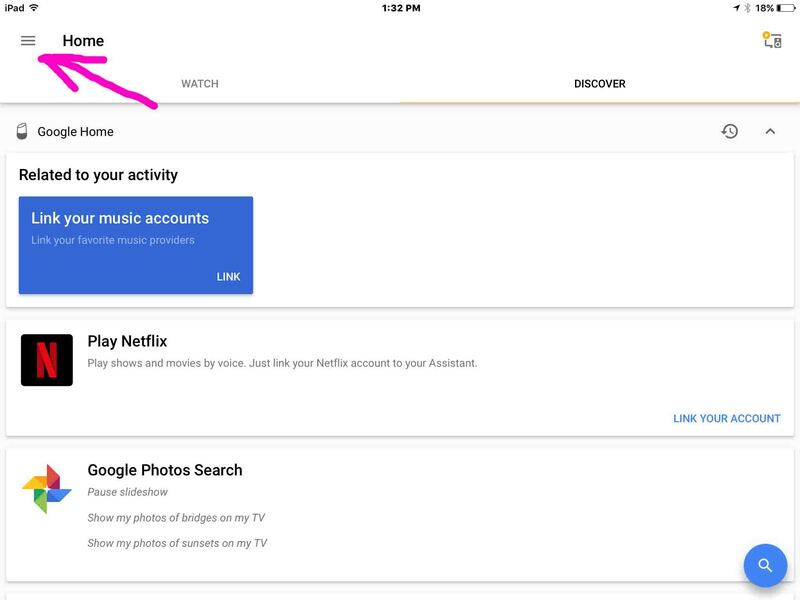 Google Home app on iOS, displaying the -Music Service Choices- screen, showing the unlinked Spotify service highlighted. But if you experience a change of heart, and would like to reinstate Spotify streaming on your Google smart speakers, then simply add back your Spotify account info into Google Home. 2018-04-09: Revised the post content.